For several weeks, I had been planning a blog post regarding the extension of Line 4 of the Paris Subway towards the suburb of Montrouge. Unfortunately, construction work has delayed the opening of the new extension until at least March of 2013; the station Mairie de Montrouge had been tentatively scheduled to open by December 31, 2012. Why the delay? From what I am hearing from Parisians in the SkyScraperCity and Symbioz forums (the latter one is in French; you can use Google Translate or Yahoo BabelFish to translate); it is taking much longer than expected to dig through the numerous quarries that lie underneath Montrouge. In fact; the entire routing of the subway extension towards Bagneux (planned to begin construction in 2014) had to be altered in order to avoid massive quarries that would otherwise undermine the stability of the ground above. You can see in these photos how complex some of these quarries are. Sadly; the tentative date of December, 2012 for the opening of the new Montrouge station was quite unrealistic given the many surprises that lurked underneath Montrouge. No one could really know the stability of the quarries until the digging commenced. On the flipside however; it is better to delay work, than to rush things and have something disastrous happen during operation of the subway line. We certainly don’t want to imagine any such scenarios. With this said; I hope to be able to report back towards the end of 2012 as to the status of the Line 4 extension. I will also post at the time; an update of the extension of Line 12, which is still expected to open in December, 2012. Back in 2009, I embarked on a week-long trip to Belgium & France. During my stay in Paris, I became fascinated with the city’s subway system. The system, unlike many here in the US, operates rubber-tyred subway trains. That’s right, the trains run on rubber tires (although each outside tire is reinforced by a steel wheel on the inner axle to allow the train to run if a tire goes flat). One such example is pictured below. Pictured here is the MP 89CC rubber-tyred subway train. For those of you who may not be familiar with the naming conventions that the Parisian transit authority (the RATP) uses for their subway fleet, I have a brief description in the next paragraph. Notice in the photo that the train is equipped with rubber tires on the outside of each axle. Behind the tires is a steel wheel, which again helps keep the train on track if a tire goes flat. 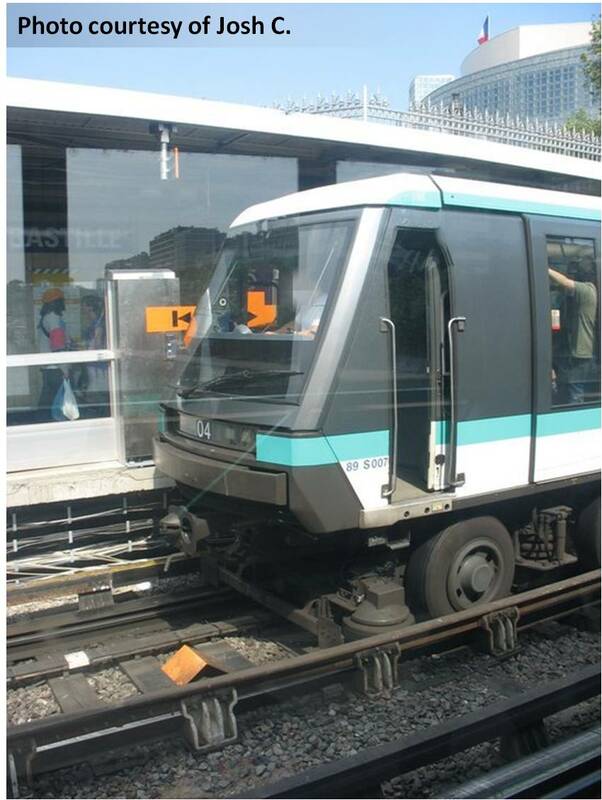 One of the reasons why the RATP and many other transit agencies use rubber tyred subway trains is because they tend to have a much better grip to the tracks than the traditional steel wheeled trains. This is especially the case on lines where there are steep grades because traditional trains tend to have a harder time braking. The rubber tyred trains on the other hand can stop in a similar nature to that of a car or bus.